Ribbons are so much fun to decorate with. They are inexpensive and can add a big punch for the cost. That is my kind of decorating! This is a project that is perfect for springtime or summer, and so easy to make. With windows open for fresh air, the ribbons will be blowing in the breeze. The perfect effect for your princesses’ room. 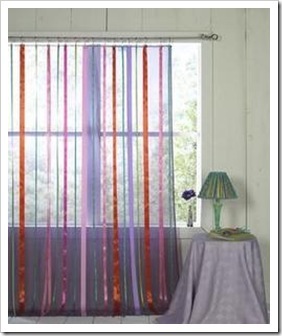 < You’ll need a tension rod and about 10 yards each of five different ribbons (the amount will vary depending on window size). 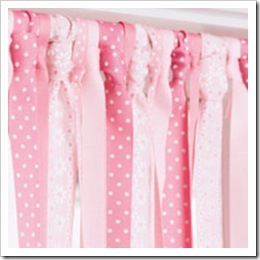 < Cut the ribbons a few inches longer than you need in order to reach the sill, then tie each length onto the rod in a necktie knot. < Alternate colors or patterns. You could also do as I did, and trim the ribbons in more of a valance length. Vary the lengths. This isn’t about precision! These are so sweet to look at. Go ahead and make one. Let me know if you do. Is it just me, or does your car get like this too? I don’t think a trip in the car has ever gone by without some new piece of trash being tossed on the floor of my vehicle. Because I am so super smart, Mensa qualified, scored 180 on IQ tests, copied this from Good Housekeeping several years ago, I no longer suffer from losing my children in the car every time we take a trip in the car..
Get a laundry basket for your car. Keep it in there at all times. Use it to put in all things that need to be brought in from your car – trash, toys, sports equipment, kids… And the double duty part is that when you bring home groceries, put your grocery bags into the basket and you can carry in several at a time. So this works for me.